Busted Refrigerator? - Fix Your Own Refrigerator Issues! First off, I’m not a refrigerator repair man but I am somewhat handy. I’ve owned several refrigerators including a GE GSS25IRFR and a LG LFX28968ST. Both had issues and I grew tired of paying $500 for repairs so I learned how to fix them myself. Interestingly, most refrigerator issues can be repaired with a $100 part and less than an hour of work. I generally spent more time researching the issue than actually fixing the fridge so I created this simple blog to help others find the solutions more quickly. These products are sold via my amazon affiliate account so I make a couple bucks for your purchases in return for helping you learn how to solve your own refrigerator problems without paying for a repairman. This is the first issue I ran into with my GE Refrigerator a few years after we purchased it. Basically, the door water dispenser quit working. The light came on and it dispensed ice ok but no water. After a few hours of research online I learned it is a fairly common problem with GE refrigerators. The insulation inside the door eventually becomes less effective so the water lines inside the door freeze. Fortunately, there is a cheap and easy fix for it. GE has released a small set of wires that connect to the electrical system of the water heater and heats the water line. I know, a bit of a hack but it works and is much cheaper than calling a repairman to replace the insulation. You can purchase GE part #WR49X10173 from amazon. If you feel the water from your GE Refrigerator Water Dispenser is too slow then it could be that your water filter needs to be replaced. GE suggests you replace the filter every 6 months but I tend to get around to it every year or so. Each time I replace it I am surprised how much more water pressure I get through the dispenser with the new filter. If your pressure is low on your water dispenser and you haven’t changed your filter in a while then I’d recommend purchasing a new filter from amazon. The new MWF replacement water filter reduces contaminants like mercury, toxaphene, p-dichlorobenzene, carbofuran, alachlor, benzene, lead, cryptosporidium, and giardia, the MWF is a safe and affordable way to contribute to a healthy lifestyle. 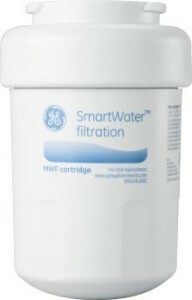 Purchase the GE refrigerator water dispenser replacement filter from amazon. A few months ago we started hearing a high-pitched “whine” or “whistle” from the rear of the GE refrigerator. I pulled it out, unplugged, unscrewed the back cover, cleaned the fan and coils in the back. A few days later, the same thing so I cleaned it all out again. It seemed that the fan blades were rubbing against the outside housing but I couldn’t seem to get it lined up properly to keep it from happening. So, I decided to purchase a new $17 fan motor from amazon and see if that would fix it. Sure enough, it took about 20 minutes to replace the fan motor and the whistling stopped, never to return. 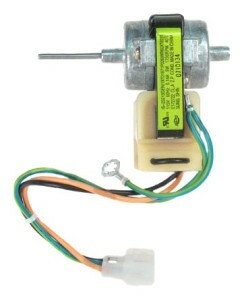 You can purchase the $20 fan motor that worked for my GE refrigerator from amazon.